Shrimp Stuffed Potatoes recipe by Farhana at PakiRecipes.com. Scrub potatoes to clean. Bake potatoes at 425 F for 45-60 minutes, or until done. When cool enough to handle, cut in half. Scoop out the potato , leaving a firm shell, about 1/4 inches. Add to the potato , butter, milk/sour cream, onion , cheese, salt and pepper. Whip the potato until almost smooth. In a separate pan, melt butter or drizzle in oil and saute the shrimps with spices that you prefer like garlic , onions, coriandar, etc. After the shrimps are done, stir in the sauted shrimps to the potatoes. 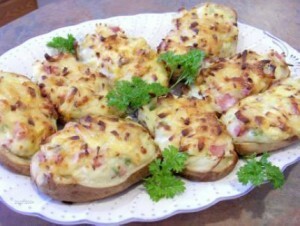 Spoon potato mixture back into shells. Sprinkle paprika and grated cheese on top. Bake at 425 F for 15-20 minutes.